1 of 3 Heat oven to 425 degrees . 2 of 3 Coat a baking sheet with nonstick cooking spray. 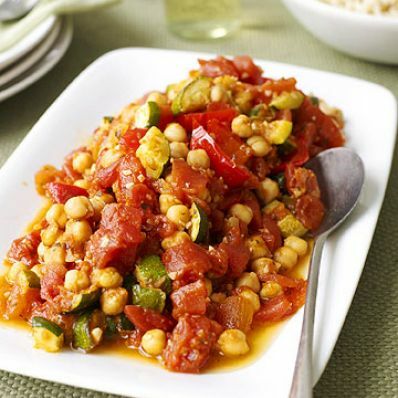 Add zucchini and red pepper; toss with 1 tablespoon olive oil. Bake at 425 degrees for 30 minutes or until tender. 3 of 3 Heat remaining 1 tablespoon oil in a large nonstick skillet over medium-high heat. Add garlic, cook 30 seconds to 1 minute. Stir in tomatoes and cook for 5 minutes, stirring occasionally. Add zucchini, peppers, chickpeas, salt, pepper and red pepper flakes. Cook an additional 5 minutes, stirring occasionally. Serve with cooked brown rice. Per Serving: 1 g sat. fat, 67 g carb., 16 g pro., 9 g Fat, total, 855 mg sodium, 10 g fiber, 402 kcal cal., 0 mg chol.